Traditional braces remain the most common and time-tested orthodontic treatment available. These fixed braces are proven effective for addressing minor misalignment as well as correcting more severe malocclusion. Traditional braces are ideal for children as well as patients who need orthodontic correction to avoid speech impediments and/or periodontal disease. 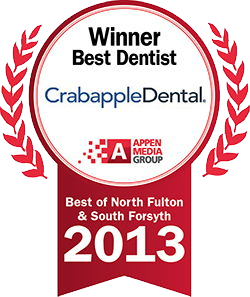 At Crabapple Dental, we are pleased to offer a full menu of orthodontic treatments from your trusted family dentist. 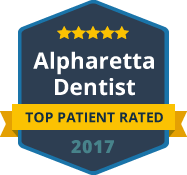 Dr. Roberts is an experienced and caring dentist who is uniquely trained to offer traditional orthodontics so that you can attain the straight, functional and beautiful smile you deserve. Traditional braces involve wearing metal brackets that are securely bonded to the front tooth surfaces. A small wire is used to connect the brackets across the teeth, which also allows Dr. Roberts to tighten and adjust the movement of your teeth and jaw throughout your treatment. Modern orthodontic advancements allow for today’s braces to be less bulky and more comfortable than in past decades. In addition, our high-quality metal braces are typically less expensive than other orthodontic treatment alternatives. When choosing traditional metal braces at Crabapple Dental, you can trust Dr. Roberts to carefully discuss your treatment plan up front. Through advanced technology and imaging, we can typically give patients an accurate estimate on treatment time as well as explain how often they can expect to visit our office for adjustments. Most of all, our staff will go above and beyond to create the most comfortable and rewarding experience for you at every step of the process. A straight smile is more than just a pretty smile. Teeth that are well-aligned are easier to keep clean, and they make chewing and speaking more efficient and comfortable. Traditional braces can allow you to smile with confidence while also helping you avoid long-term threats to your teeth and jaw that can be caused by crooked or crowded teeth. It is never too late to undergo an orthodontic correction. Dr. Roberts is equipped to provide braces for all ages! At Crabapple Dental, we have the unique ability to maintain the health of your teeth throughout your orthodontic treatment. Traditional braces can make it a challenge to keep your gums and teeth clean and strong. However, by choosing Dr. Roberts, your smile health will be routinely evaluated so that you don’t encounter costly and disappointing dental issues like decay and gum disease when your braces are removed. To learn more about traditional braces or to schedule your consult for a straighter smile, please contact Crabapple Dental in Alpharetta today.